Dubai Design and & Fashion Council (DDFC) in partnership with FAD Institute of Luxury, Fashion & Style Dubai (FAD Dubai) to unveil Dalia El Ali’s latest collection at Fashion Scout during London Fashion Week. The ‘DDFC x FAD Dubai Fashion Showcase’ initiative is responsible for sponsoring the participation of Emirati and UAE-based designers to showcase at Fashion Scout London, the leading independent platform at London Fashion Week. Featuring the partnership between FAD Dubai & DDFC, the initiative is offered exclusively to DDFC members, and combines the Council’s and FAD Dubai’ s efforts to foster the development of a sustainable fashion industry in the UAE and MENA region. Drawing inspiration from the enchanting symbolism of the universe, Dalia El Ali breathes new life into her eponymous label, Dee By Dalia, through her transcendent collection Sirius. Illustrating the hidden secrets of the stars amongst incendiary messages of female empowerment where interstellar digital graphics become entangled with bold embroidery. In her highly anticipated London Fashion Week debut, Dee By Dalia illuminates the runway in fiery offerings of cosmic symbolism intertwined with visual references to the strength of women. draws an air of striking confidence juxtaposed against luminous femininity and sophistication. Dynamism of women is explored through powerful structures with an emphasis on bold shoulder detailing that visually ties the 80s era through the collection. The variation of silhouettes brings with it a celebration of the uniqueness of the female physique. 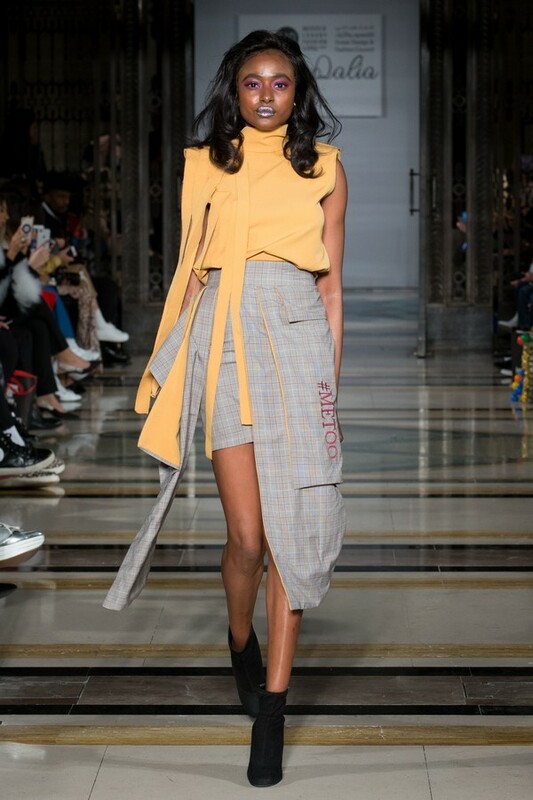 Dee by Dalia is the brainchild of acclaimed creative designer Dalia El Ali, brought to life after the completion of her illustrious studies at London College of Fashion in 2013. From humble Lebanese-Palestinian origins and an upbringing in the UAE, Dalia has now cultivated a prominent following for her ready to wear brand as a burgeoning homegrown label within these regionsthe MENA region. Incorporating her signature style and personality into each collection, Dalia illustrates the flirtatious personality of her collections with a visage of ruffles, bandages and cut-out silhouettes. Pioneering bespoke graphics for the first time her capsule collection for AW18, Sirius illustrates her creative flair for innovative textile printing and design. Celebrating a decade of dedication to the global fashion education, FAD Institute of Luxury, Fashion and Style is evolving as a leading creative arts and fashion school, with campuses in Dubai, Mumbai and Pune. FAD Dubai offers professional, industry tutored courses certified by KHDA (Government of Dubai) in Luxury, Retail, Fashion & Styling. FAD Dubai envisions to be at the forefront of delivering world-class professional training in the Middle East & contribute towards the greater vision of UAE to rise as a global industry epicenter in Fashion & Luxury. The institute aims at fostering strong relations with world’s leading creative schools and industry to allow cultural and academic exchange between global creative communities in the region. In 2013, His Highness Sheikh Mohammed Bin Rashid Al Maktoum issued Decree No (23) determining the formation of the Dubai Design and Fashion Council (DDFC), a member of the Dubai Creative Clusters Authority (DCCA). Established in 2014, DDFC’s mandate is to raise the profile of Dubai as a regional and global destination for design and fashion, ensure the contribution of the creative industries to the sustainable development of the Emirate, stimulate trade and tourism, develop local talent, and attract companies operating in the fields of design and fashion to Dubai. Chaired by Dr. Amina Al Rustamani and run by CEO Jazia Al Dhanhani, the DDFC board consists of 14 board members representing a mix of key stakeholder groups; including government, academic, and private sector experts. The board members are Ali Jaber; Dean of Communication, American University of Dubai; Ashok Sawlani; Managing Committee, Dubai Textile City; Azza Fahmy; Chairwoman & Chief Designer, Azza Fahmy Jewellery; Farida Al Awadi; President APID, Managing Director, Cinmar Design; Ghassan Harfouche; Group CEO, MCN; Khalid Al Tayer; CEO Retail, Al Tayer Group; Mohammad Al Shael; CEO Business Development, Department of Economic Development; Nisha Jagtiani; Director, Landmark Group; Patrick Chalhoub; CEO, Chalhoub Group; Mr. Christopher Newman, COO, Emaar Hospitality Group; Raja Trad; CEO, Leo Burnett and Publicis Group of Companies MENA; Reem Acra; CEO, Reem Acra; Saeed al Falasi, CEO, Dubai Festivals & Retail Establishment; Shireen El Khatib; SVP Brand Development and Special Projects, CEO Office, Majid Al Futtaim Ventures. DDFC oversees, supports, promotes and drives initiatives related to 5 key design segments – Fashion Design, Product Design, Architecture, Interior Design, and Graphic Design.